The name Go, that we use in the West, is actually Japanese (they also sometimes call it Igo); in Korea it is called Baduk and in China it is called Weiqi (pronounced "Wei-Chi"). Go originated over 3,000 years ago in China and is very much a part of Oriental culture. You can read about its world history. It was brought to the UK from Japan over 100 years ago and Go continues today to expand in popularity. You can read much about the history of Go in the UK too. Go has very simple rules and concepts, but a complex strategy. You start with an empty board, alternately placing pieces which don't move (called stones) on it, trying to surround empty areas, whilst capturing your opponent's stones by surrounding them and taking them off the board. However, as with a lot of simple concepts, it can take a little while to grasp them and a long time to master them. One of Go's best features, unlike almost all other games, is the handicapping system. This allows players of very different strengths to play a proper game giving each player a 50% chance of winning and unusually compared to other games with a handicapping system Go players often play handicap games. Also unlike many other games draws are almost non-existent, but the margins of winning/losing can be very small. Unfortunately the rules can often be badly described and hard to understand, especially on rule sheets supplied with some Go sets - but do not let that put you off! We have a complete introduction, with some videos, on our How to Play page. Anyone aged from under 5 to over 90, male or female! More than 10% of Koreans and a smaller proportion, but still many millions, play in Japan and China. Go is less well-known outside East Asia, with probably a few thousand active players in Britain, but the number of players is increasing world-wide now that you can play on the Internet. There are more than 70 countries where organised Go is played, see the International Go Federation website and the European Go Federation one. There are about 1,000 full-time professionals in Japan, Korea, China and Taiwan with a number of part-time ones now in North America and Europe. The largest prize for winning a tournament is now close to $1 million! The Korea Amateur Baduk Association has produced the following English language video: Introduction to Go (just over 10 minutes long). It talks about the background to the game and world-wide spread, rather than just the rules. We also know a number of well-known people who have played Go, as diverse as Albert Einstein and Rod Stewart! You may have seen Go played in the movies, in such as "A Beautiful Mind" or "Pi", or in television programmes such as "24" or "Enterprise", or read about it in novels such as "Shibumi" or "The Girl that played Go". More and more, Go is entering Western culture as well as Oriental. If disability prevents placing the stones, then calling out the co-ordinates of the intersections can be done for an able opponent to place the stones instead. Partially sighted or blind people can also play, as described on our Go for the Blind page. If you are a Chess player you may be interested in a Chess-Go comparison. You can play Go at home, in clubs and in tournaments. Against a computer or another person on the internet you can play any time, day or night. Visit our Where to Play for more information. There is advice on buying Go books and equipment. When you played a few games, you will realise there is an awful lot to Go. We have some tips and pointers on our Learning pages to guide you. Many young people play. Visit our Junior section and if you're an organiser or teacher our Youth Go organisers section to find out how we can help you. Go features strongly in Japanese comics for adults - see our Manga and Anime page. 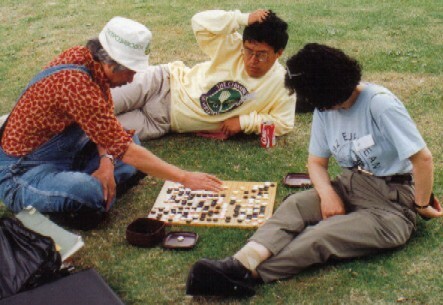 At the British Go Association we are passionate about the game of Go, and we hope you will find the game just as appealing as we do. If you want someone to come and visit your organisation and give a presentation on Go and how to play, contact us.